Home Tags Posts tagged with "asean summit"
President Donald Trump has revealed he has a “great relationship” with Philippine President Rodrigo Duterte, after a highly anticipated meeting in the country’s capital Manila. It was unclear whether President Trump raised human rights violations in the Philippines, despite calls for him to do so. Barack Obama’s administration had spoken out against Rodrigo Duterte’s war on drugs, which has killed almost 4,000 people. President Trump is almost at the end of an extensive Asia tour. 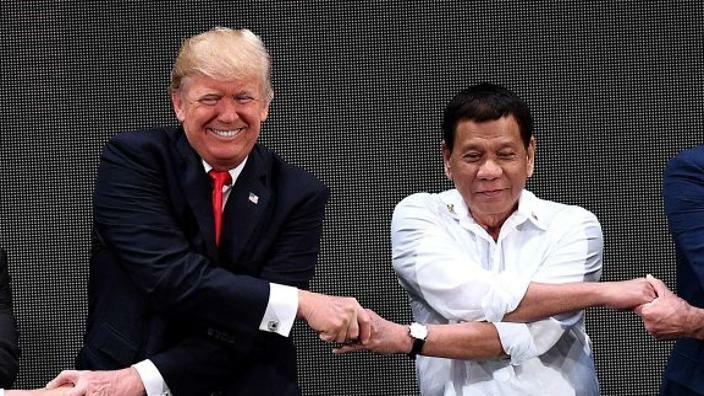 The first meeting between Donald Trump and Rodrigo Duterte, which took place at the Association of South-East Asian Nations (ASEAN) summit, was closely watched as both are known for striking a controversially outspoken and direct tone. After the private meeting, President Trump did not respond to questions about whether he had raised the subject of human rights while a spokesman for President Duterte said the topic had not been discussed. White House spokeswoman Sarah Sanders later said the topic was mentioned briefly in their private meeting, in the context of the war on drugs, but did not give further details. On November 10, President Duterte said he stabbed a person to death when he was a teenager. His spokesman later said the remark had been “in jest”. Since coming into office in 2016, Rodrigo Duterte has presided over a massive crackdown on crime in the Philippines, which critics allege undermines fundamental human rights. The Filipino president has encouraged extrajudicial killings of those involved in the drug trade, and said he would “be happy to slaughter” three million drug addicts in the country. Police say they have killed almost 4,000 people in anti-drug operations since 2016. More than 2,000 others have been killed in connection with drug-related crimes. A Philippine government transcript of the April 29 phone call was later leaked to US media. President Trump and other leaders attending the ASEAN event had already met on Sunday evening at a gala in Manila ahead of the summit. During the evening, Rodrigo Duterte took to the stage to sing a Filipino hit love song, afterwards saying it had been “on the orders of the commander-in-chief of the United States”. Demonstrators took to the streets in Manila on November 12 and 13, protesting against Donald Trump’s visit and carrying banners like “Trump Go Home” and “Ban Trump #1 terrorist”. Riot police used water cannon and sonic alarms to repel the protesters. Donald Trump’s visit to the Philippines wraps up the president’s five-country trip to Asia which also had him visit Japan, South Korea, China and Vietnam.